MG Hunting is an organization that meets the needs of hunters worldwide both in big and small game hunting in Argentina. The great number of hunters that join us for their hunts every year and their testimonies are excellent proof that we are a leading company in organizing hunting programs. For the last 20 years, with MG Hunting ´s donations, we have also been helping Chapters support SCI’s efforts to protect hunting around the world, and fulfill countless conservation, education and humanitarian projects. This 5-day hunt is performed at the Province of La Pampa, 600 Km distance from Buenos Aires, and one-hour flight from Buenos Aires City. 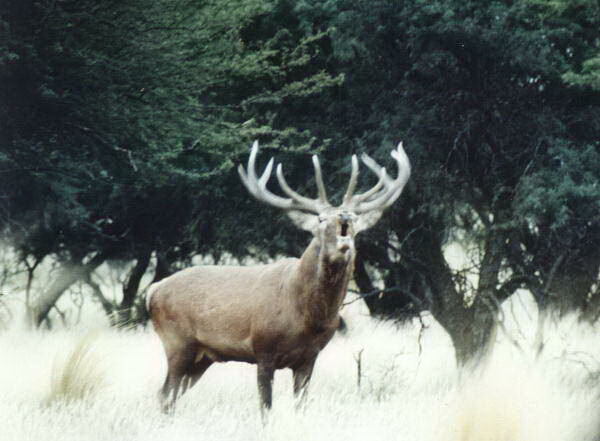 The Red stag is definitely one of the most important trophies in South America, and you will have the opportunity to harvest excellent trophies. Our private hunting area of 25,000 hectares has a high population of red deer, where gold medals are yearly gotten. La Pampa is one of the most untamed zones of Argentina, that shelter within its high bushes a great amount of Mountain lions, European wild boars, Water buffaloes, different species of Rams and Wild goats. The hunt of these trophies can be combined with this Red stag program. Marcelo Gil, owner of MG Hunting, will be handling your program and will be present from the moment of your arrival until your departure. His wealth of experience will assure that your hunt be not only successful, but also unforgettable. § Reception and paperwork assistance in all Argentine airports. § Transfers amongst the different hunting spots of the hunting areas in modern all-terrain vehicles, and vans. § Accommodation in own Lodge, close to the hunting areas in comfortable double-occupancy suites. § Personalized attention by safari organizers. § Skinning and salting preparation. § Local flights and layovers in Buenos Aires, international telephone calls. ACCOMMODATION: Our lodge offers the most exclusive comforts with 6 double-occupancy suites, heating, a large dining area, and comfortable sitting rooms for complete private relaxation. MEALS AND BEVERAGES: Meals are generous. The main ingredient is Argentine’s world-famous beef. Special menus are prepared, upon request (vegetarian, salt-free, etc.). Alcoholic beverages are included in the price (beer, scotch whiskey, champagne, and wines). FIREARMS, SHELLS AND EQUIPMENT: Argentine regulations allow entering up to three firearms maximum per person, at a cost of $ 120 per gun. If hunters would not want to travel with firearms MG HUNTING can provide rifles in various calibers at US$ 70 daily rental. We suggest bringing warm clothing for winter months (May to August). MG Hunting provides everything else.